Showing 37 articles from February 24, 2016. Franklin County Emergency Services is opening the Louisburg Senior Center in the Shannon Village Shopping Center on Bickett Boulevard in Louisburg as an emergency shelter, beginning at 1 p.m. Wednesday. Any resident who feels the need to seek shelter can go. 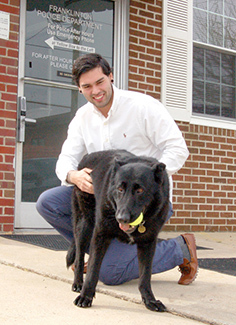 Companion animals, however, will not be allowed at the shelter. They can be taken to the county's Animal Control Shelter on T. Kemp Road in Louisburg. RALEIGH -- Let the confusion ensue. Earlier this month, a three-judge panel ruled that the state's Second and Twelfth Congressional Districts were unconstitutional and ordered that state legislators redraw the maps. The result is that Franklin County will go from having two Congressional representatives, separating the northern and southern end of the county, to one. Well, no, actually. But that is a drone flying in the upper left corner of this photo and it's taking both still photographs and video of the raging house fire below. But the fire was just a drill for the Louisburg Fire Department, which set the long-vacant house at the corner of South Main Street and NC 56 West in Louisburg afire on Saturday as a training exercise. Once the training was over, the fire was allowed to destroy what was once the home of Buck and Josephine Harris, both of whom are deceased. FRANKLINTON -- The head of the town's auditing firm told staff that he would handle bookkeeping matters, personally. During the board's January meeting, Scott May presented commissioners with an audit that was expected to generate a warning letter from the state regarding the town's fiscal practices. FRANKLINTON -- When Chase Villarreal and Toki were deployed to Afghanistan, they had one job -- help sniff out bombs in explosives-ravaged Kandahar. Actually, Toki had a secret mission. Before departing, Villarreal's mom, Belinda, whispered something in the K-9's ear -- "Take care of my son." RALEIGH -- Attorneys for two troopers accused of causing a cadet's debilitating hip injury began their defense last week, arguing that plaintiffs failed to prove that instructors acted with malice or outside the scope of their duties. The four-week-long court case is the culmination of a worker's compensation legal fight that began in the fall of 2011 when Martin, now a Franklin County sheriff's deputy, filed a suit against Troopers Gregory Gentieu and Susan Moreau, instructors during the 29-week State Highway Patrol training program. Despite all the changes and confusion about the upcoming March Primary Election, I trust you're planning to cast your vote! Early voting begins March 3 -- and the actual Primary Election Day is March 15 for those of us who like to head to the polls and cast votes in person on the traditional election day. But however you vote, there are two things to do: First, get informed a little about the candidates and second, actually cast a ballot. Forget terrorism, this is here -- and deadly! Can you imagine the chaos that would happen if a small group of terrorists slipped into a small American county and killed 90 to 100 American citizens? The county would suddenly be hip-deep in Homeland Security agents plus law enforcement officers from an entire alphabet soup of state and federal agencies -- FBI, SBI, ATF and more! 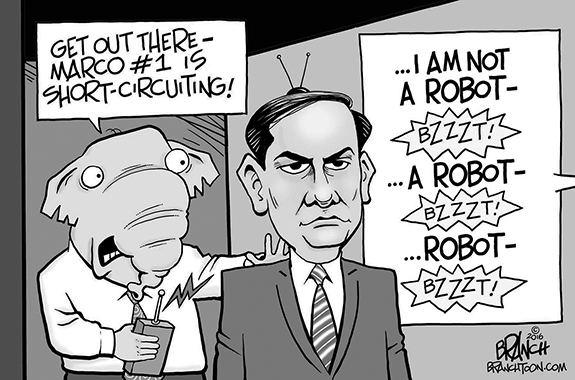 Politicians would line up to capture the headlines if only for a minute. Can federal gov't make others do job for them? There are always lines, right? And, if there are lines, there are always sides because, one thing we are not is a country of fence sitters. The most recent divide is over whether Apple should comply with a judge's order to unlock the telephone authorities allege belonged to a man who, along with his wife, opened fire and killed 14 people before they died in a shootout with police. Last week North Carolina politics was as clear as mud and it only became marginally clearer as the week came to an end. Earlier, a three-judge federal panel declared two of North Carolina's 13 Congressional districts unconstitutional, including the 13th, which encompassed a large portion of Franklin County. The judges gave the General Assembly until Friday to draw compliant districts. Is there a chicken in your pot? As of today there are only six days until March 3, when early voting starts for the 2016 Primary Election. The question is: do the citizens of Franklin County have trust and confidence in local leadership? On March 15 the election result will start to answer that question. Looking back, are you satisfied with your elected officials' job performance? If statistics mean anything, and we all know they can be manipulated, the majority of people say they are not satisfied, and have not been for some time. Richard Blaine Marshall, 76, of Winston, GA passed away February 21, 2016 in Las Vegas, NV, while visiting his very dear cousin, Doris Bumgardner. Graveside services will be held at Macon Memorial Park Cemetery in Macon, GA on February 27, 2016 at 2 p.m. EST. The family will greet friends following the service. LOUISBURG - Doris Strange Phelps, 89, of Louisburg, died Wednesday, Feb. 24, 2016. George Thomas, 95, of 432 NC 56 Highway, East, Louisburg, died Thursday, Feb. 18, in Louisburg. FRANKLINTON -- Open visitation for Loretta C. McGreen, 80, who died Tuesday, February 23, 2016, will be held Saturday afternoon from 1 until 4 p.m. at Richardson Funeral Home in Louisburg. Her funeral services will be held in her hometown of Centerville, TN. Maggie W. Allen, 85, of 1631 Dyking Road, Louisburg died Tuesday, Feb. 9, 2016, at Autumn Winds Assisted Living Center in Louisburg. PRODUCER AT THE POINT. Franklinton HS point guard Smith Gupton (right) drives for a basket during last Friday night's championship game against Southern Vance at the NCC Boys Basketball Tournament at the Bunn Dome. BUNN - Franklinton had gained a well-earned reputation as a clutch team that finds ways to win close boys basketball games. Time and time again this winter, the Red Rams have been effective down the stretch, and that intangible helped Franklinton earn the Northern Carolina Conference regular season crown. But Franklinton couldn't replicate those heroics during last Friday's championship game of the NCC Tournament at the Bunn Dome. CLUTCH CALVIN. Louisburg's Calvin Manley (with ball) drives for a basket during last Thursday's victory over Southeast Halifax in the semifinals of the TRAC Boys Basketball Tournament. WELDON -- Louisburg High School has picked the right time to peak on the boys basketball hardwood, and the result to date has been a deep run in the Tar-Roanoke Athletic Conference Tournament -- and maybe even more heroics to come in the Class 1-A State Playoffs. 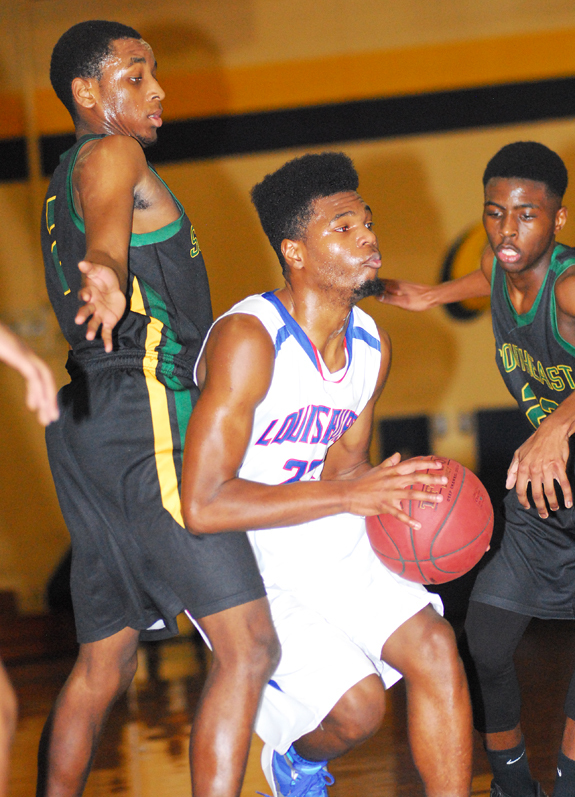 Louisburg roared during the TRAC Tournament, which was staged last week at Weldon High School. 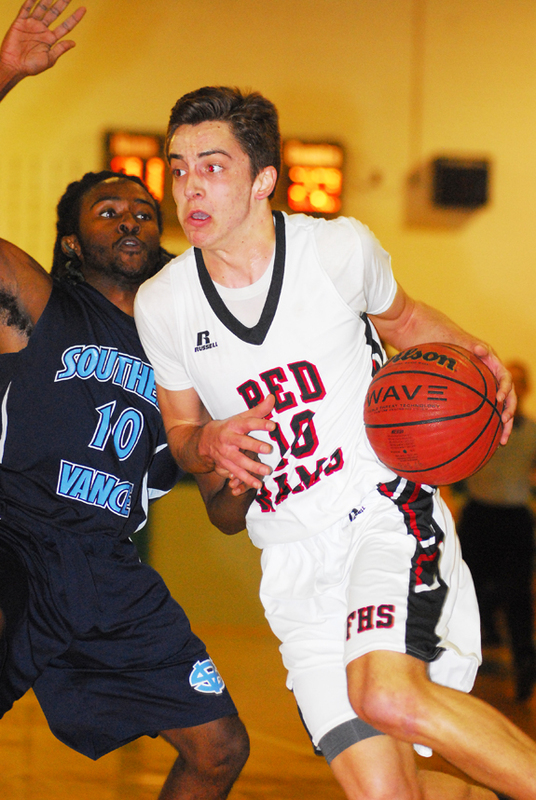 The Warriors won a rubber match against Southeast Halifax in the semifinals with a spirited 55-49 triumph. LOUISBURG -- Louisburg College earned a key Region X home victory last Wednesday as the Hurricanes remained in the top spot in the league with a 79-75 comeback victory against Bryant and Stratton. LC trailed by 11 points at halftime, but mustered a huge rally in the second half, outscoring the visitors from Virginia by a 79-75 margin at Taylor Center on the LC campus. 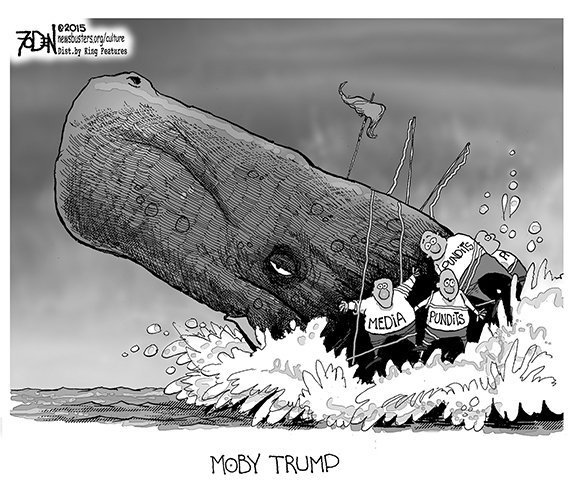 TREMENDOUS TEAM. 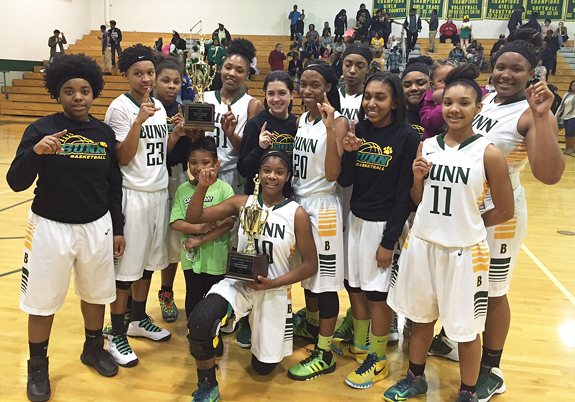 The Bunn Ladycats have repeated as the Northern Carolina Conference Girls Basketball Tournament Champions. BUNN -- Most of Bunn's current players were in elementary school the last time the Ladycats failed to win the championship at the Northern Carolina Conference Basketball Tournament. The year was 2009 -- right before Whitney Bunn arrived and helped start an upward trend that has continued for the past seven seasons. Two of those campaigns featured unplayed tournaments due to poor weather make-ups, so BHS coach Matt Keith made sure to remind his club of its tradition-rich success before last Friday's tourney finale at home against Warren County at the Bunn Dome. BUNN -- Few combinations in high school football are as lethal as a good running back and quality offensive linemen. That's exactly the combo the Bunn Wildcats featured this past season en route to reaching the Class 2-AA State Finals. Two of those standouts finalized their next-level plans last Thursday as lineman Justin Holder signed with Mars Hill College and wingback Bruce Adams inked a deal with Averett University. NEXT STOP -- AVERETT. 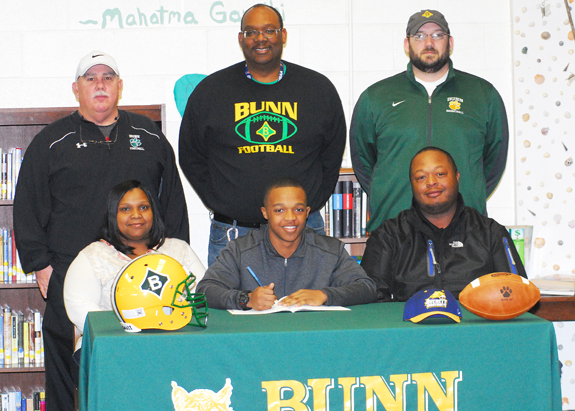 Bunn High School's Bruce Adams (front, center) signs a letter-of-intent to continue his football career at Averett University, which is located in Danville, Virginia. Also pictured are (back, l to r) BHS grid coach David Howle, BHS Assistant Principal Daniel Wright and BHS assistant football coach Chris Lewis; (front, l to r) parents Tarsha Adams and Bruce Adams, Sr.
FARMVILLE -- Bunn High School's boys basketball squad saw its season come to an end with an 88-64 road loss at top-seeded Farmville Central in Tuesday's opening round of the Class 2-A State Playoffs. The Wildcats (9-16) trailed by just four points at halftime, but Farmville pulled away with a 24-12 surge in the third quarter of action. 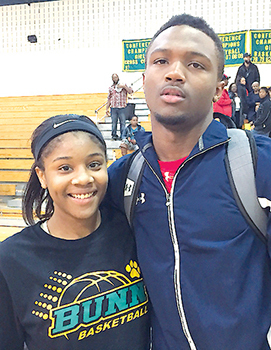 Ikesta Johnson poured in 28 points for the Jaguars, while Bunn was led by Quenten Wright's 17 points. LOUISBURG -- For Louisburg College cross country coach Jay Koloseus, recruiting is just as much about projection as it is past accomplishments. So when Koloseus seeks out performers for his strong program, he also studies that athlete's passion and potential. 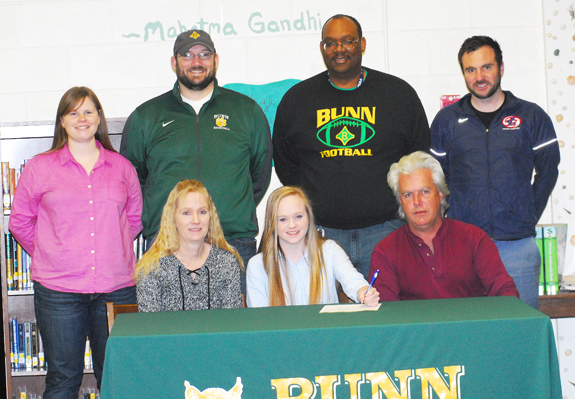 And he sees both intangibles in Bunn High School senior standout Haley Sheehan. After an effective distance career at Bunn, Sheehan has opted to continue running in college, and she has signed a letter-of-intent to compete for the Lady Hurricanes the next two seasons. LOUISBURG -- Repeating as the team champions at the Middle Athletic Conference Wrestling Tournament proved to be twice as nice for the Terrell Lane Tornadoes. For the second straight season, TLMS picked up a MAC mat crown at the annual event, which was hosted earlier this month by the Tornadoes. 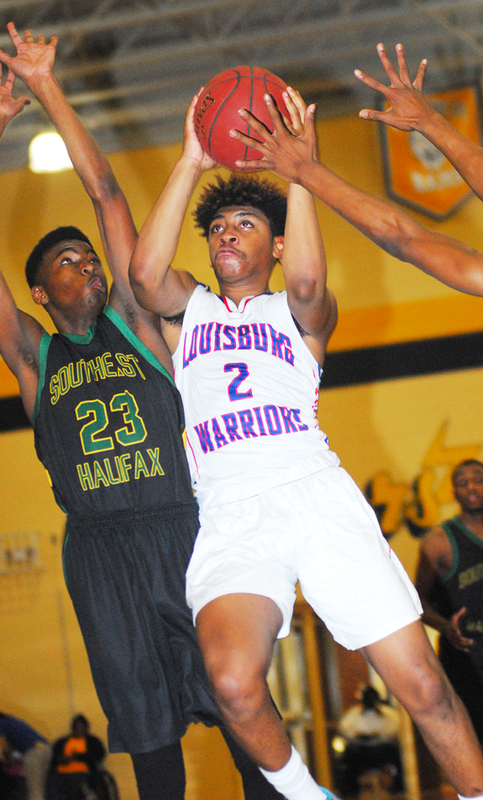 Louisburg High School's Octavius Scoggins (with ball) splits the Southeast Halifax defense during last Thursday night's semifinal meeting at the Tar-Roanoke Athletic Conference Boys Basketball Tournament in Weldon. The Warriors will return to Weldon today for a second-round showdown against the Mighty Chargers in the Class 1-A State Playoffs. Kids 'N Kritters: A tried and true recipe for success! Youth and animals go hand-in-hand. Franklin County's tradition of producing outstanding livestock, along with many outstanding young people interested in raising and showing animals, has prevailed for decades. As a young agent who began my career as an Agricultural Extension Agent in 1988, I have seen my first 4-H'ers from over two decades ago grow up into responsible, law abiding adults and now their children are raising and showing their own animals. 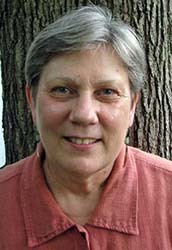 Lu Ann Jones, a historian who has studied and written about women, agriculture and the South, will discuss the career of pioneering home extension agent Anne Pauline Smith during the Tar River Center for History and Culture's annual Joseph Elmore Lecture at 7:30 p.m., Thursday, March 3, in Benson Chapel on the Louisburg College campus. Jones' lecture is free and open to the public. 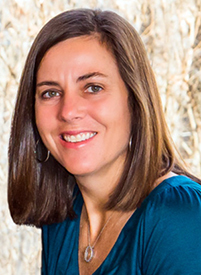 Amy Perko, executive director of the Knight Commission on Intercollegiate Athletics, will be the guest speaker for Baptist Women's Day at Louisburg Baptist Church. The event will be Sunday, Feb. 28, during the church's 11 a.m. service. Perko serves as the commission's spokesperson, and has been quoted and interviewed by leading news media, including: USA Today, The New York Times, The Wall Street Journal, Bloomberg News, and numerous public radio stations. The Franklin-Vance-Warren Opportunity, Inc., Head Start is accepting children for the 2016-17 program year. Children must be 3 years of age as of Aug. 31, 2016. Parents of children with mental, physical or emotional impairments are being encouraged to apply since the program will make special provisions to serve children with special needs. Those provisions can include but may not be limited to adaptive equipment and transportation. FORT JACKSON, S.C. -- Bunn High alum Nadine G. Bell completed basic infantry training. During the nine weeks of training, Bell studied the Army mission, history, tradition and core values, physical fitness, and received instruction and practice in basic combat skills, military weapons, chemical warfare and bayonet training, drill and ceremony, marching, rifle marksmanship, armed and unarmed combat, map reading, field tactics, military courtesy, military justice system, basic first aid, foot marches, and field training exercises. YOUNGSVILLE -- Police are looking for suspects who fired shots into a home during an apparent attack. According to a report by Officer S. Zuniga, a 23-year-old Youngsville man was returning to his S. Nassau Street home during the early morning hours of Feb. 16 when he alleges he was approached by an armed gunman wearing a hooded sweatshirt. Franklinton Police Sgt. 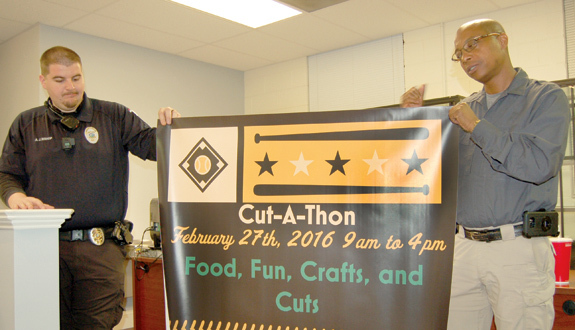 Andrew Bishop, left, and Police Chief John Green Jr. show off a banner touting the Franklinton Recreation Association's Cut-A-Thon fundraiser that will be held at Hair by Marshall in Wake Forest on Feb. 27. Money raised during the event will go toward scholarships to help youngsters, who might not otherwise be able to pay, participate in the t-ball, baseball and softball program. 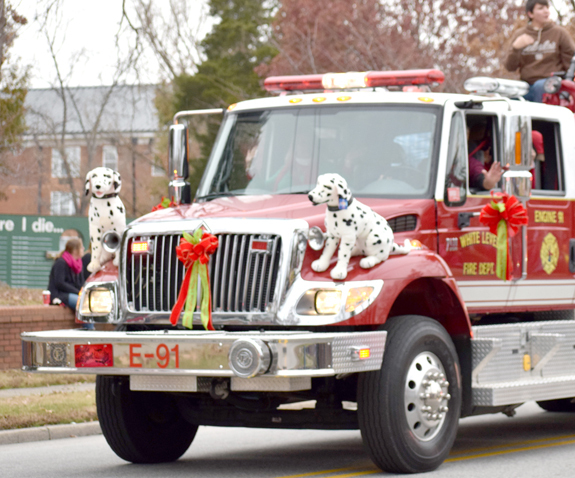 The event will feature a food truck on site and it is a family event. LOUISBURG -- Franklin County sheriff's deputies arrested a Louisburg area man on breaking and entering charges. Officers executed a search warrant at a home on Firetower Road on Feb. 15 and allege they found evidence that implicated John Boydston in a Feb. 14 home invasion in the 2700 block of White Level Road. Officers also allege they found evidence from a Feb. 10 break-in reported on Huntington Drive near Louisburg.